An interesting credit score data mining observation has emerged from our friends over at Credit Karma. Apparently they took a look at the average credit scores of 20,000 people and placed those scores into bins based on the email address people use. They then calculated the average credit score. Now your email domain is not an indication of credit worthiness and switching to a different email provider does not impact your score at all. It’s just an interesting observation of the credit scores of people that typically use a particular email provider. If you use BellSouth as your email provider, your score is the highest in the survey results. Congratulations. If you are using an email address from Yahoo or AOL, the average credit score of your fellow email users is, well, in the toilet. 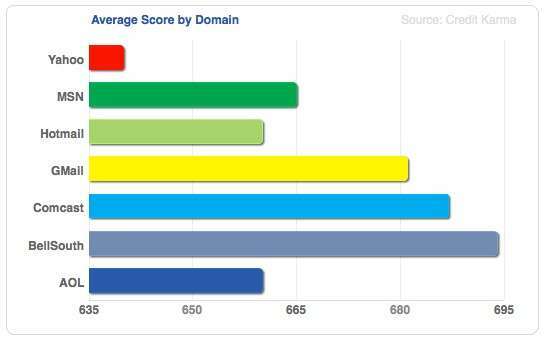 Seems among the mainstream free email providers, Gmail users are the king of the credit score hill, followed by MSN, Hotmail, and Yahoo at the bottom. It looks like the average credit score of GMail users is 682 while Yahoo users are down at 640. That’s quite a difference. Author: This article was contributed by GetOutOfDebt.org, a site that provides free help for people looking for debt consolidation advice.